TITLE LOBBY CARD ORIGINAL MOVIE POSTER. For Thousands of Vintage Movie Posters. Perfect for a high end home theater. Highly sought after by movie poster collectors and aficionados. Get notified of our AUCTIONS & NEW INVENTORY instantly! LOBBY CARD ORIGINAL MOVIE POSTER issued by the studio when the film was released and meant for theatrical display. This lobby card is NOT FRAMED. We do offer custom archival frames for an additional cost U. An incredibly rare lobby card in any condition. All original material on Casablanca is scarce and very rarely surfaces for sale. Highly sought after by collectors. This is a vintage original lobby card from our archives. L OBBY CARD Lobby cards are no longer used in theaters and are rarely printed for today's films. These small posters on card stock (usually 11" x 14" in a horizontal format) were generally produced in sets of eight, intended for display in a theater's foyer or lobby. A lobby set typically consists of one Title Card, a lobby card of special design usually depicting all key stars, listing credits and intended to represent the entire film rather than a single scene; and seven Scene Cards, each depicting a scene from the movie. There are also Mini Lobby Cards measuring 8 1/2" x 10" (stills). These can be very difficult to find in any condition! A long time can go by without one of these coming up for sale. You will have trouble finding a nicer one. Expertly restored, only a well trained eye can tell what was done. The red colored main title has faded a bit to orange. All four corners have been repaired/replaced about 1. A few pin holes have been repaired. The entire white background has been painted/touched up. The main image and all the text including the large main title did not need any work done. This is NOT a reprint or reproduction lobby card poster! We will put in writing that we guarantee it to be an Original Movie Poster. 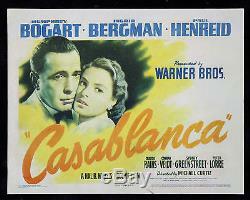 The item "CASABLANCA CineMasterpieces ORIGINAL MOVIE POSTER TITLE LOBBY CARD 1942" is in sale since Wednesday, July 02, 2014. This item is in the category "Entertainment Memorabilia\Movie Memorabilia\Posters\Originals-United States\1940-49". The seller is "cinemasterpieces" and is located in Scottsdale, Arizona. This item can be shipped worldwide.